As the most critically acclaimed American comedies of 2010, the one thing that Cyrus , Greenberg , Please Give and The Kids Are All Right have in common is that they were all the cinematic products of former award-winning independent filmmakers now working within the studio system. Instead of succumbing to the lust for the almighty box office dollar by helming formulaic pictures with A-list stars that center on plots and people that possess little in common with reality, the directors in question haven't abandoned their indie roots in the slightest. They may have attracted Oscar caliber performers but bravely feel that they're under no obligation to conform to “what sells,” by continuing to write their own work and produce provocative material that falls somewhere in between the genres of comedy and drama wherein humor is always character-based rather than punchline-based. Almost serving as an accidental big screen companion piece to TV's Emmy winning Modern Family , of course one of the biggest success stories of 2010 was the timely and topical The Kids Are All Right , which truly broke away from the pack by seducing both a mainstream audience as well as most of the momentum during award season. Yet despite the fact that I enjoyed all of the works, in my eyes -- and perhaps with Please Give falling only a hair behind -- the strongest and most genuinely fascinating human comedy of last year was Fox Searchlight's wonderfully surprising Cyrus . 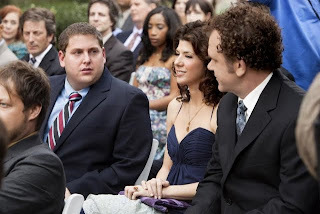 A satisfying three-handed game in terms of the performances by its lead actors John C. Reilly, Marisa Tomei and Jonah Hill, Cyrus was written and directed by the Duplass brothers and coincidentally produced by the Scott brothers (in the form of Ridley and Tony). 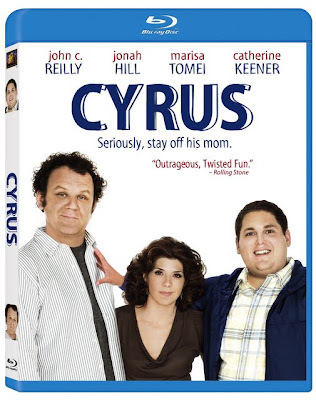 By emphasizing sincerity in terms of both the revelations of the characters and the unveiling of bizarre situations, Cyrus achieves an amazing feat in transcending a risky plot premise concerning Hill's irrationally jealous titular adult son who's threatened by the new man (Reilly) in mother Tomei's life. Needless to say, in lesser hands this plotline alone could've either evolved into the stuff of creepy camp a la Happiness and Chuck and Buck or wandered into incestuous territory that would have everyone reaching for the eject button. And while it is cringe-worthy indeed, unlike – say – Observe and Report or Greenberg filmmaker Noah Baumbach's Margot at the Wedding – the Duplass brothers never force us so far into discomfort that we lose respect for the movie, actors or characters as we scratch our heads over the hippie close relationship epitomized by Tomei's Molly and Hill's Cyrus. Throughout its downright delightful roughly ninety minute running time, the Duplass brothers play it precisely the right way. By treating everything with sensitivity, matter-of-fact honesty and constant questioning -- much like Reilly's loner divorcee John -- we therefore try not to give in to paranoid suspicion when his shoes mysteriously go missing during the very first night he spends at new girlfriend Molly's place. Yet for John, forthrightness and always choosing “truth” instead of “dare” can have its consequences even though he hopes that his willingness to continually open up rather than play it cool will increase the intimacy in his relationship with Molly and bring him closer to Cyrus. For at the same time, he fails to realize that every time he makes another confession, he's ultimately giving Cyrus every card he needs to figure out just how to beat his hand in their escalating battle for Molly's undivided love and attention. Intriguingly though, none of the confrontational scenes in the movie go too far or feel forced which is particularly admirable given both Reilly and Hill's background working in Judd Apatow style outrageous free-for-alls. 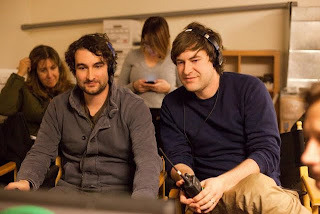 Although this success perhaps owes to the fact that much like the Apatow collaborations, the Duplass brothers encourage their actors to not only improvise but also rephrase the script's dialogue from the point-of-view of the parts they're playing so that everything remains truly in character. Innately understanding and putting their own spin on their onscreen alter-egos allows Hill and Reilly to explore the same comedic skills they've used in blockbusters in the past and filter it through a more dramatic framework so that even when Cyrus veers into wild territory, it still feels grounded in reality and completely human. And given the studio's dedication to unveiling creatively daring, incredibly well-written movies that break the mold from Little Miss Sunshine to Slumdog Millionaire to Juno to (500) Days of Summer to Sideways , Cyrus further cements Fox Searchlight's place as this generation's Miramax. 2010's unsung sleeper Cyrus is not only tailor-made to the talents of its inherently likable cast but is also well-suited to attracting a larger fan base on disc. Moreover, it comes highly recommended – particularly on Fox's high quality high definition Blu-ray transfer with film festival style extras and a suitably odd homegrown, home movie filmed Q&A featuring the Duplass brothers and the Duplass baby daughters.